Pizzelle are biscuits traditionally from Molise and Abruzzo. In an electric mixer, beat the eggs and sugar. Add vanilla extract and melted butter. On low speed, gradually add flour and baking powder to make a sticky dough. Drop dough from a teaspoon onto the hot iron. 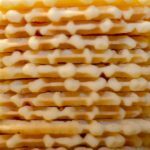 If the iron you are using allows you to bake 2 pizzelles at once, drop a teaspoonful into the center of each pattern outline. Close the cover of pizzelle iron and bake for 30 to 45 seconds, or until nicely browned. Using two forks, remove the hot wafer from the iron and place the pizzelle flat on a parchment-lined cookie sheet. Be sure to lay the hot pizzelles in a single layer on the cookie sheet. When they are completely cool, you can stack them. Chocolate: add 1/2 cup cocoa to the dough along with the flour. Lemon: substitute 2 teaspoons lemon extract for the vanilla. Add 2 tablespoons lemon zest (grated rind from 2 large lemons). Almond: Replace vanilla with almond extract.